Butter and Jam, 32" scapes, 5 1/4" flower, dormant, midseason, 5 way branching, 25 buds, tetraploid. 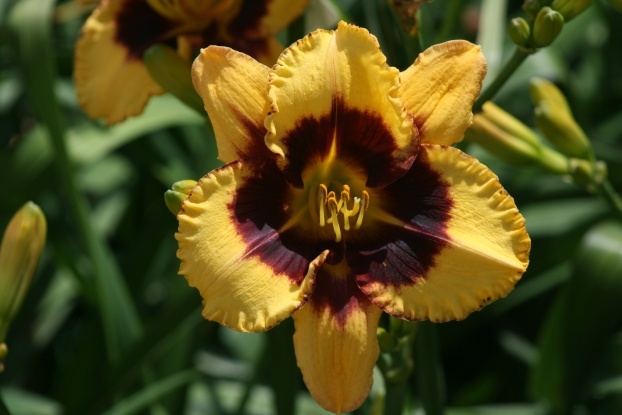 (Desperado Love X Seedling) I had no intention of introducing this daylily until this past summer when every garden visitor wanted to buy it. The deciding votes were cast by two well known garden/exhibition judge instructors who insisted that they had to have it. A very vigorous grower blooming well above the foliage. Has given some interesting patterned eyed seedlings. Very fertile both ways, will set numerous bee pods. Inquire.